Lookie what I found! Isn't it pretty? And BIG! I guess there's two of them. Even better! Just checked it out. There is only one. 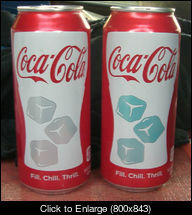 The ice cubes turn blue when the can is cooled. I found these in 7-Eleven. The banner in the window made it appear as though these were exclusive to 7-Eleven. Where did you find yours? I read somewhere these cans are exclusive at 7-Eleven. 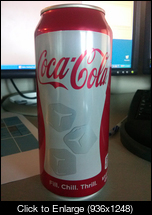 Ugh, was hoping to find these cans... closest 7-11 is about 75 miles away from me. I found my in 7-11. I haven't seen them anywhere else.